We live in a dynamic economic environment and staying straight as well as narrow when it comes to your own personal finances can definitely feel like a struggle at certain moments. Impulse buys, piling monthly bills, recreational activities, as well as unexpected costs, can quickly become overwhelming and relying on a quick loan might seem like a good idea. 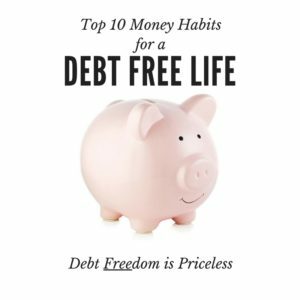 Even though you don’t see it at the moment, you will quickly appreciate how much more beneficial leading a debt-free life truly is. Here are 10 healthy habits that you can create in order to keep going in the right direction. Almost every single resource is going to point you towards maintaining a serious monthly or yearly budget and sticking to it. That’s great as it’s pushing you towards becoming much more responsible towards your finances. However, your life should define your budget, not the other way around. By planning for a few steps ahead of time, you would be capable of making an actionable budget based on your life, not the other way around. Not using credit cards is great if you can afford it. However, they also provide us with certain freedom of handling emergency situations. However, you should only charge as much as you can properly afford to repay at the end of the month. That’s the golden rule of thumb that you must absolutely follow. This is something particularly reasonable and very beneficial. Instead of just throwing away cash for whatever you feel like eating, spend the money reasonably. Understand what’s on sale during this particular season and if you like it – go for it. Of course, you shouldn’t base your diet around sales, but it doesn’t hurt to spend your money with care. There are quite a lot of online service providers where you can find a range of discount coupons. Lozo.com is fantastic for groceries. Ebates.com is a great resource for everyday shopping to not only get coupons but also rebates through their platform. In fact, if you play your cards right, you might get a discount on almost every single product that you buy, including restaurant dinners or a night at the cinema. The more you postpone your bills, the more late fees you will have to pay. Organize your income and spending in a way to designate a certain day of the month during which you clear your current bills. As we mentioned above, you need to have a sound financial plan for your future goals as well. It’s important to know where you are headed and what are you saving for. It’s good to have money in the bank as long as you have a designation for it. Saving aimlessly is doing you no good, especially if you are compromising on your life to do so. This is particularly critical. You need to ensure that you are well aware how your money is spent. Ideally, review your finances at the end of each month. See what you spent and what you can maybe spare. Map out the things that you can do without and make sure to avoid them for the future. This is also something of huge importance. You need to treat your savings as if they were just another monthly bill. This will make you feel responsible for it and as such, you would prioritize. Choose to purchase items you absolutely love, not just like. Consider having a rule of thumb that you cannot purchase the item upon first seeing it. Leave the store and go home and after 2 days if you still really want it, then purchase it. This is going to push you away from unnecessary impulse buys. While this is an easy way to becoming debt free, it isn’t always as simple as it sounds because often it means taking on more work. However, if you choose to take on side jobs you love, then you will end up earning more money, being fulfilled, and spending less money because your time is now allocated to productivity rather than shopping. There are quite a few different things which can generate extra income. UBER, for instance, is a great start if you have a nice car and healthy driving record. There is also a ton of freelance work on the Internet that you can handle as well from websites like www.Upwork.com. Creating healthy financial habits will bring you more freedom in the long-term and living a debt free life is full of amazing rewards but it takes discipline.